The Washington Post has honored UMBC double-alumnus Sean Pang as its 2017 Teacher of the Year in recognition of the supportive connections he makes with Rockville High School students as an educator, tutor, coach, and mentor. The honor is tremendously meaningful for both Pang and UMBC’s education programs, particularly following last year’s recognition of Shalonda Holt ’07, biological sciences, teaching certificate in education, as 2016 Washington Post Teacher of the Year. Sean Pang ’09, English, M.A. ’11, education, has taught ninth-grade English, creative writing, TV production, and an academic intervention course since he began working at Rockville High School in 2011, but he didn’t always realize he had a passion for writing and language arts. Pang arrived in the United States from Hong Kong at age 6, and his love of English literature grew over time, particularly through his undergraduate years. In particular, Pang thanks his UMBC mentors Sally Shivnan, senior lecturer in English and associate director of writing and rhetoric, and Jim Thomas, lecturer in philosophy, for inspiring his teaching career and guiding him on that career path. Having taught Sean Pang in English classes starting in first-year composition and all the way through to his time as editor of our creative arts journal Bartleby, I can say I am not surprised to see him win this honor. His energy and commitment were always incredibly impressive…[and] the values that won him recognition as DC-area Teacher of the Year—passion, creativity, and caring—reflect UMBC values. 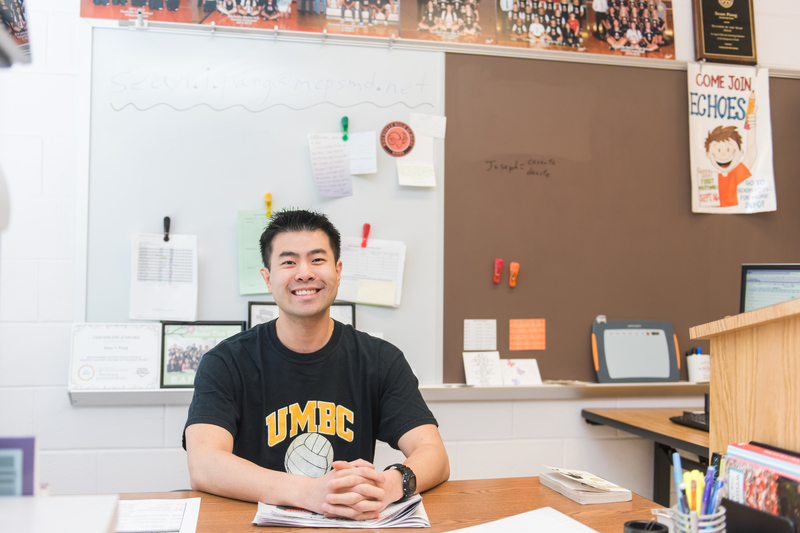 This “buzz” of activity directly reflects Pang’s teaching philosophy: “to get involved in as many ways as you can.” He applies this advice to his students and himself — encouraging students to try new things to find their passions, and working to connect with students in a wide variety of ways. He also applies it to his own professional development as a teacher, building connections with colleagues whom he sees as mentors, and constantly working to improve and grow in new directions. Photos of Sean Pang by Marlayna Demond ’11 for UMBC.